I love a sequin pant, but this holiday party season I'm looking for something a bit more day-to-night versatile, a metallic pleated skirt! 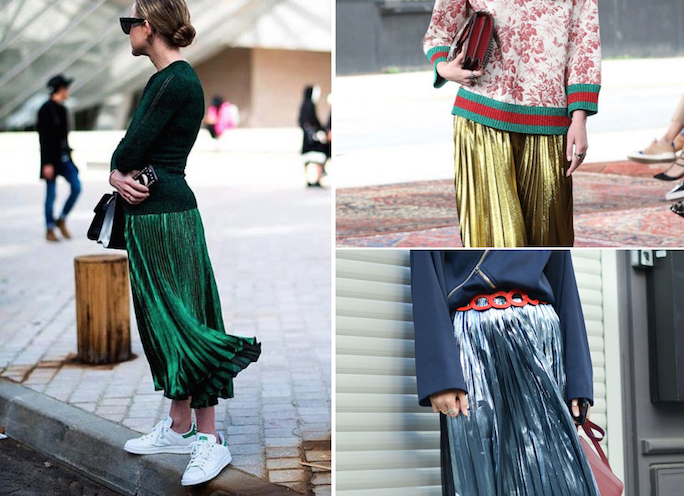 From classic metallics such as gold, bronze and silver to jewel tone colors, a metallic pleated skirt makes an instant impression without trying to hard. Celebrities have been stepping out in designer lame pleated skirts to wow the press and fashionistas everywhere know that this trend can be taken for a standout daytime look just as easily. Actress Dakota Johnson dressed to impress in a pleated midi purple lame Gucci skirt and made her look winter appropriate with a fur jacket, tights to keep warm, and some 70s revival platforms! Get her look for less with this jewel toned metallic pleated skirt. Fashion icon Alexa Chung gave us cool girl holiday style by mixing her gold lame pleat skirt with more casual striped sweater and sleek black pumps. Get her look with this under $100 version gold pleat skirt. For some real party perfection, take a cue from fashionista Solange Knowels and look for a bronze or rose gold pleated midi skirt. She mixed hers with a similar toned top and stilettos for understated glam that would work for a boozy brunch or cocktail party. 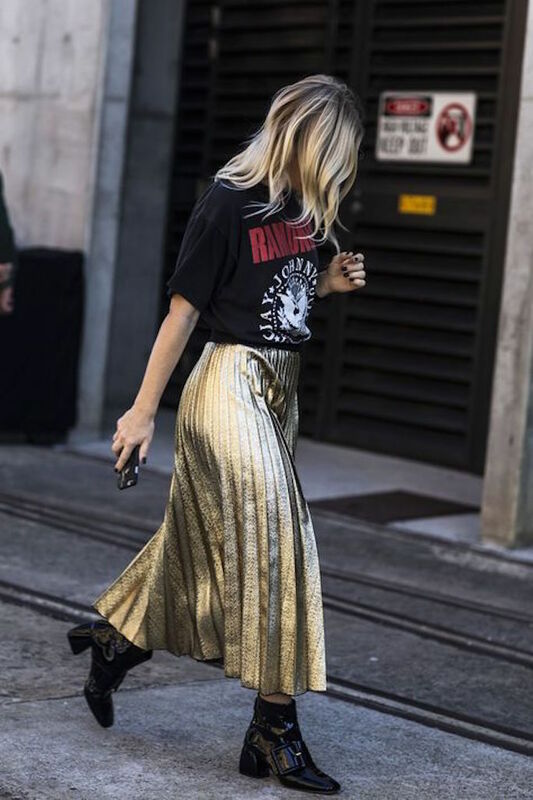 To take your metallic maxi skirt from night to day dress it down with items you already have in your closet such as classic sneakers and a leather jacket. To up the anti on this trend look for a striped metallic pleated skirt or this lame printed maxi skirt. For a sophisticated and warm winter look incorporating the lame pleated skirt trend, keep your outfit monochrome from head to toe. A silver pleated maxi skirt with an oversized grey sweater achieves instant chic! Last but not least, my personal favorite way to wear a metallic pleat skirt is to pair it with a concert tee for some downtown edge! Throw on a leather jacket or faux fur in the winter and take it off when the weather allows to keep rocking this trend through spring. Get the look with this under $100 bronze pleat skirt.